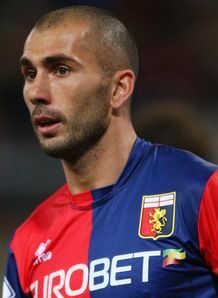 At thirty-two Marco Di Vaio of Bologna has played for eleven different clubs in three different countries during his long career. The forward has played for Lazio (1994-95), Hellas Verona (1996), Bari (1996-97), Salernitana (1997-99), Parma (1999-2002), Juventus (2002-04), Valencia (2004-05), Monaco (2005-2007), and Genoa (2007-2008). In 2008 the journeyman may have finally found a permanent home with his unbelievable play this year for mediocre promoted club Bologna. Di Vaio is certainly a well respected forward in Italian football. Di Vaio scored twenty goals in 2002 for Parma and was among the finalists for the European Golden Boot Award. The next season, following a transfer to Juventus, Di Vaio was a Serie A League Champion. It appeared at this point of Di Vaio’s career that it would be his prime years of Italian football competition. After one more year with Juventus, the goal-scoring forward moved on to La Liga squad Valencia where he put up a few club-leading years on offense, but due to the enormous talent Valencia had acquired by signing David Villa the club loaned out their star player to the French league. At Monaco Di Vaio’s game turned sour and the journeyman only scored eight goals in twenty starts for the squad over a two year span. Di Vaio decided to move back to familiar stomping grounds and rejoined Serie A when he signed with Genoa for the 2007/2008 season. At Genoa the vet did not get many opportunities to start and only managed three goals in his long awaited arrival back to Serie A. So after scoring only eight goals in three seasons, Di Vaio reemerged this year with a career best twenty-four goals for Bologna. The result was among the best in all of Europe this season.